Two new studies, involving a newly identified gene, show that Alzheimer’s disease could be diagnosed as much as 20 years before symptoms develop. The area is the posterior cingulate of the brain, which is affected by AD in very early stages. The studies by Dr. Mark Sager, professor of medicine at the University of Wisconsin School of Medicine and Public Health (SMPH) and director of the Wisconsin Alzheimer’s Institute, and Sterling Johnson, SMPH associate professor of medicine and researcher at the Geriatric Research Education and Clinical Center at the Madison VA Hospital, were presented today at the International Conference on Alzheimer’s Disease in Honolulu. Sager’s study included 726 healthy, middle-aged people with a family history of Alzheimer’s disease. All carried both the newly identified gene (TOMM40) and APOE, a well-established risk gene for Alzheimer’s. Researchers discovered that the 229 people with the high-risk version of TOMM40 did significantly worse on tests of learning and memory than study participants with the low-risk version. Johnson found that healthy, middle-aged adults who have the high-risk version of TOMM40 had a significantly lower volume of gray matter in two brain regions affected in early Alzheimer’s disease. 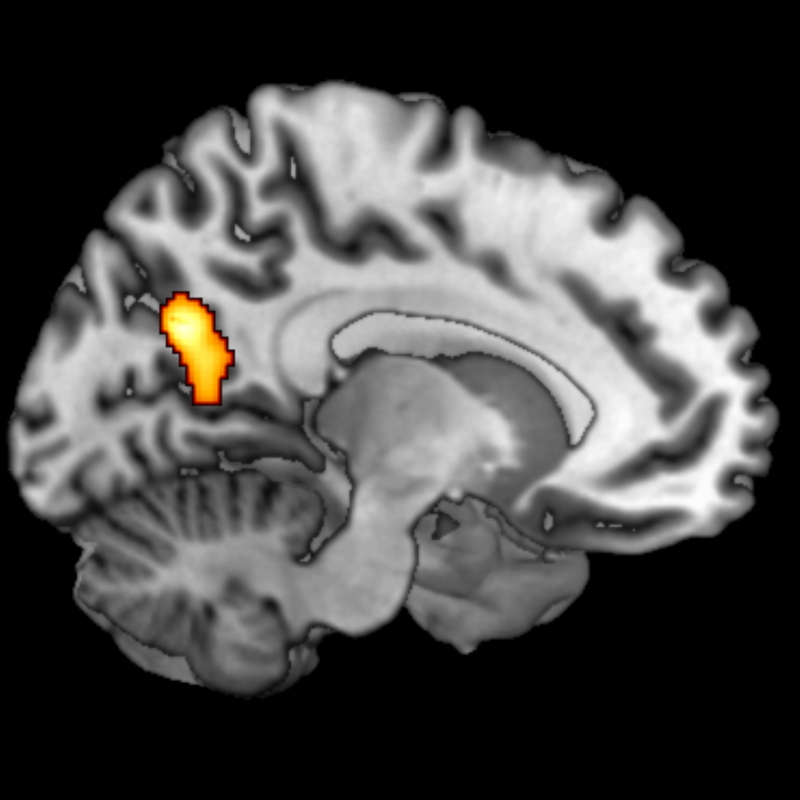 Johnson says the finding in the brain’s posterior cingulate could represent a “neuro signature” for Alzheimer’s disease. In research published last year, Duke University Medical Center researchers identified the gene and found that it not only can predict risk of developing Alzheimer’s disease, but also the approximate age when an individual will develop the disease. Study participants came from the Wisconsin Registry for the Alzheimer’s Prevention, the largest pool of middle-aged, asymptomatic adults with a family history of Alzheimer’s disease. 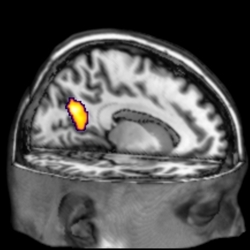 Images represent a composite of those in the study who had gray matter changes in the brain. The area is the posterior cingulate of the brain, which is affected by AD in very early stages.